Dystopia: noun. 1. an imaginary place where people lead dehumanized and often fearful lives. The word for today is "dystopia," and I'd like to thank the makers of Portal for reminding me how wonderful a bleak, empty dystopia can be. You would think Portal, with its virtually non-existent plot, absence of characters (the player-controlled character being little more than an avatar and the computer-narrator), short length and sterile design would be ill-suited to encapsulating any sort of 50-dollar words at all, much less "dystopia," but you'd be wrong. I purchased The Orange Box unsure of what to expect. 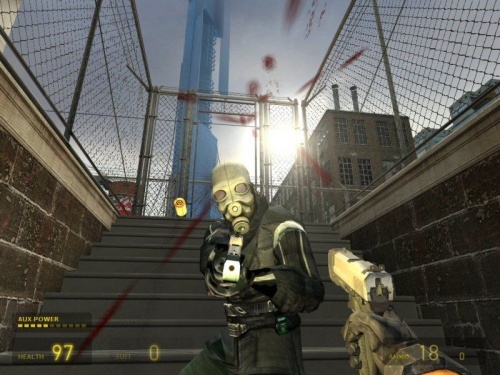 I'd played Half-Life 2 already, but hadn't played the much-ballyhooed Episode One, not being much of a fan of Steam and even less of a PC gamer of late. 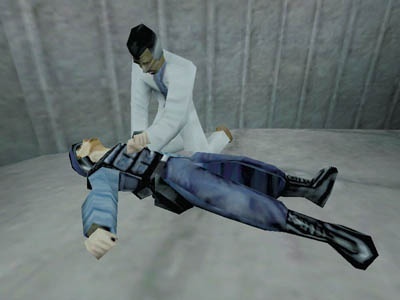 Back in the day, when the original Half-Life and Team Fortress Classic were hot properties, I'd played the crap out of both, reveling in every explosive second of gameplay. In fact, Half-Life, until recently, remained my favorite game of all time, largely because of how thoroughly it exploded all expectations of what an excellent game should be, and how it perfectly captured what seemed to be missing from all other games, how it nailed dystopia and the feeling of dread that comes with having to claw your way out of a place that was once familiar, but has now turned on its head, capturing you inside. BioShock came very close to unseating Half-Life in this regard, but ultimately fell victim (in my mind) to its own excellent storytelling. It simply tried too hard, and there were few moments - if any - in which you, as the player, felt connected to the fate of the world. This is what Half-Life taught us: In the absence of story, the player will concoct his own and become that much more engaged. Gordon Freeman graduated from MIT and worked at a place called Black Mesa. That's it. That, aside from a few incidental, extraneous extras, is all we know about him. It's all we need to know about him. The rest of his story is written (or so it seems) by us with the lion's share of scripted and gameplay ephemera occurring to him, not through him. We aren't given any grand revelations about Freeman's past as cut-scenes, and, in fact, in the original game, there aren't really any major plot moments revealed at all. The story is left scattered about as bits and pieces you can either pick up or not, and the ultimate questions (what happened, who started it and how will it end?) are left unanswered. What story elements are revealed (Barney's last stand, the arrival of the soldiers and the fabulous scene played out over the command radio in which one soldier says to the other, "Forget Freeman!") are played out in-engine as curious asides while the player retains full control of the character. Contrast this with BioShock, in which large portions of story are revealed as cut-scenes, monologues and flashbacks, and you begin to feel the difference such choices make. BioShock featured a wonderful story well told, and its highly-detailed dystopian world dripped with awesome. But in wandering Rapture's weepy halls, I rarely felt more than a tourist, and never as invested in my character's fate as I felt playing while Half-Life. I was always aware that I was playing a game and being told a story and that the two felt separate. Obviously BioShock is still an excellent game, and the best I've played in years, but in creating such a detailed story experience it crowded out the possibility that I would become invested in my story, as the person exploring the world, and if it hadn't been for Half-Life, so many years ago, I would never have known what I was missing.